The Toronto Star Weekly was the weekend supplement to Canada’s largest paper The Toronto Star. The Star Weekly was first published in 1910 and was similar in size and content to Parade or The New York Times Magazine in the United States. Note: Click any image inside this article to be taken to a much larger version on another page of this site. In addition to being a Toronto Star supplement, the Star Weekly was sold as a stand-alone publication in many other parts of Canada. From the 1940s on up (I don’t have any issues from before the 1940s) the Star Weekly was comprised of a main section, a magazine section, a comic section, and a novel. Novel section from Apr. 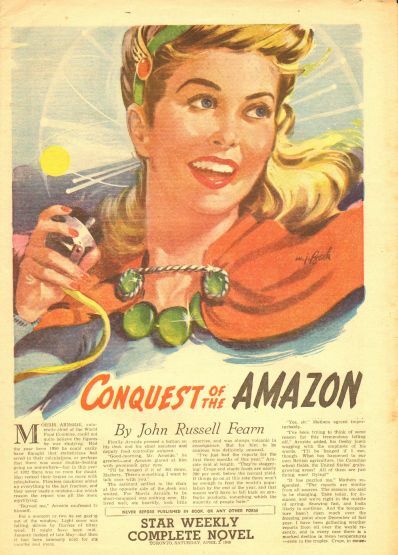 2, 1949 titled "Conquest of the Amazon" by John Russell Fearn. The main section, titled simply "The Star Weekly," generally had shorter stories and a heavy concentration of photographs. The magazine section was titled, not surprisingly, “The Star Weekly Magazine.” In the 1940s, and presumably earlier, the Magazine section was printed on newsprint and there was often two sections. The change over to glossier paper came in the mid 1950s. The Magazine section’s stories were generally longer with fewer photographs. In the early 1960s “The Canadian Magazine” was also included as part of the package. For several months the Canadian section and Magazine section were both included but, eventually, the Magazine section disappeared. Not only did the Star Weekly get thinner over the years, it also got smaller. My 1940’s issues measured about 15.5” x 11.25”. By the late 1950s the size had been reduced to 14” x 11”. It got even smaller in the 1960s. 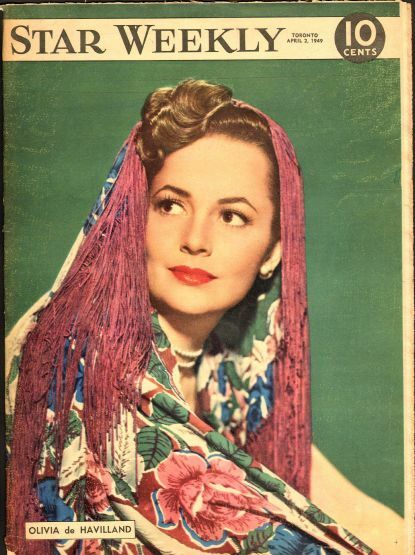 Usually the Star Weekly used nameless models for its covers but occasionally a movie star would sneak through, such as Olivia de Havilland on this April 2, 1949 issue. The Canadian section proved to be voracious and in 1968 the whole package was renamed as The Canadian/Star Weekly. That configuration lasted until the end of 1973 when it ceased publication. The Star Weekly seemed to go through a variety of trends for its covers. The late 1940s and early 1950s issues focused on pretty girls. Celebrities were used occasionally (always female) but more often it was just a nameless model. The magazine also went through a stage of cute drawings with dogs or kids who resembled the Campbell Soup kids. In the later 1950s and onward the cover would more often reflect a story within the magazine. 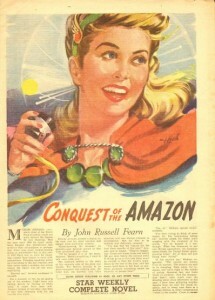 Queen Elizabeth II was a favorite Star Weekly cover subject during the 1950s. Here she graces the cover of the May 2, 1953 issue of the Star Weekly. But the real queen of Star Weekly covers was, quite literally, the Queen. For the issues I have Queen Elizabeth II was on more covers than anyone else. This is perhaps a reflection of the times. 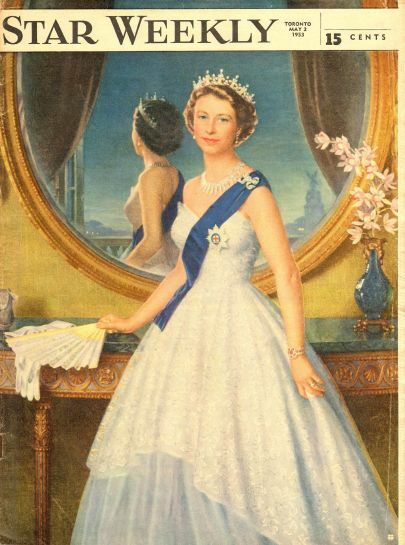 During the 1950s she was frequently in the news with her coronation and tours around the empire (including Canada). Other royal family members such as Prince Philip and Princess Margaret were frequent cover subjects, too. Owing to its large size, ability to print in color, and its Canada-wide circulation the Star Weekly attracted many national advertisers. Among the regular buyers were Pepsi, Campbell Soup, Cadbury’s, Kellogg’s, and Lux. 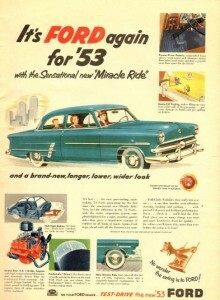 Ford and other auto makers were frequent Star Weekly advertisers. Liquor ads were taboo until 1968. Many other products, such as automobiles, Life Savers, and Arrow shirts advertised often, as well. What we didn’t see were liquor ads. In fact it wasn’t until Jan. 1968 that the Star Weekly began accepting liquor advertising. Norman Rockwell artwork was often used for Kellogg’s and Red Rose Tea ads. Like any general interest magazine the Star Weekly covered a variety of topics: politics (most of it Canadian), entertainment, sports, and human interest. What the Star Weekly liked more than anything else though was to produce a series. They printed famous Canadians, Birds of Canada, Flowers of Canada, poisonous plants of Canada(? ), entertainer pin-ups, stars of the Canadian Football League and, most importantly (for me at least), Stars of the World’s Fastest game. Since the covers of The Star Weekly were not celebrity oriented it is the series of pictures that make it collectible today. The Star Weekly’s main sports photographer, Harold Barkley, was the best in the business and a pioneer in getting color action shots of National Hockey League games. He was the first to use electronic flash to take stop-action hockey pictures and he developed special equipment for shooting color. Hockey star photos were a popular attraction from 1957 until 1966. 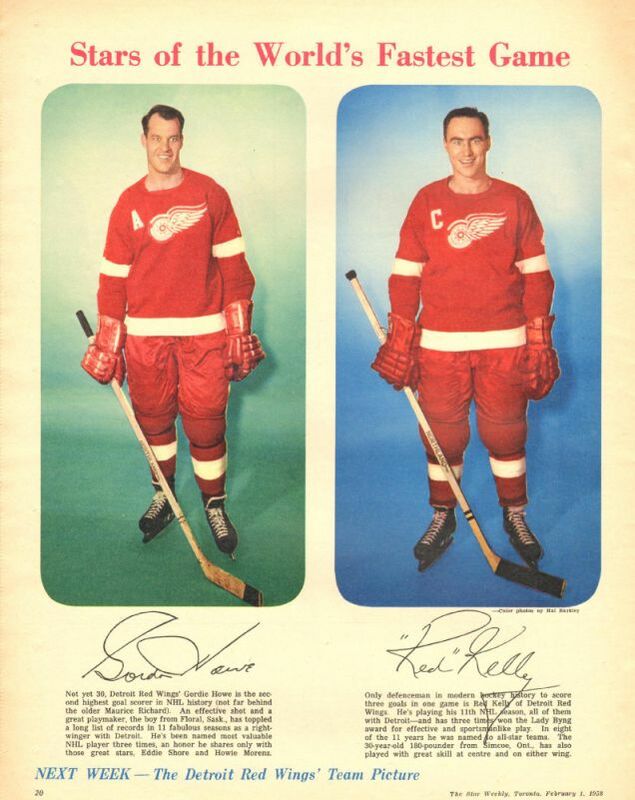 Here are Gordie Howe and Red Kelly, both of the Detroit Red Wings from inside the February 1, 1958 issue of the Star Weekly. From the 1957-58 hockey season through the 1965-66 hockey season, The Star Weekly ran a weekly color photo of an NHL star or stars. The first two seasons were posed shots and team pictures but in Dec. 1959 Barkley’s color action photos began to appear. There weren’t too many red-blooded Canadian school boys who didn’t have one or two Star Weekly photos tacked up in their bedroom. Price guides value these individual photos at up to $50 for a star player in excellent to mint condition. Lesser players can be picked up in the $5 range. Having the photo still inside an intact magazine increases its value by 50 per cent. The entertainer pin-ups represent a real bargain for collectors. 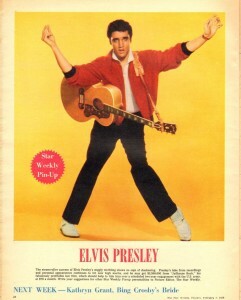 They started in late 1957 and ran until early 1959 featuring a full page, color picture of a popular TV or movie star. These are virtually unknown in the U.S. and hard to find in Canada. I’ll try to put together a checklist of photos that I have. The entertainer pin-up series ran from 1957 to early 1959. This Elvis pin-up is in the February 1, 1958 issue, the same issue as the Gordie Howe photo shown elsewhere with this article, making it a collector's double whammy. Individual comic sections and novel sections are frequently advertised on eBay with asking prices running in the $10 range. There are many things to be aware of when collecting the Star Weekly. First of all you’re probably only getting part of the magazine. Vendors usually break the sections described above into separate parts. So you’re paying separately for the main section, the magazine section, the comics section and the novel. Since the main section represented the front page of the magazine you may find that the celebrity pictured on the cover is actually written about in the Magazine section. The other problem, of course, is missing pages. With a magazine that was so fond of producing pin-ups it’s not surprising that surviving magazines will often have pages cut out. Also collectible photos are interesting ads that were on the back cover were often subject to more wear and tear and are often hard to find in good condition. 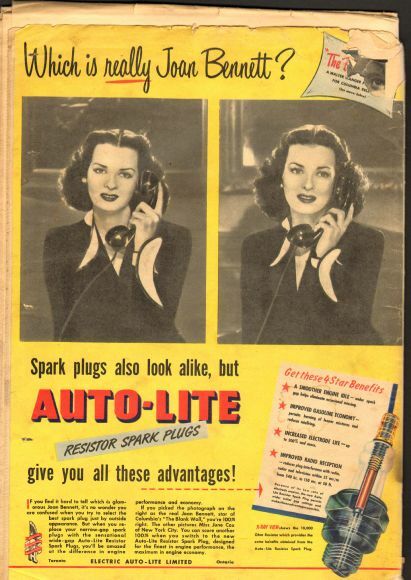 This Auto-Lite ad from Apr. 23, 1949 shows how ads on the back cover can take a beating. American politicians were not a common sight on Star Weekly covers. 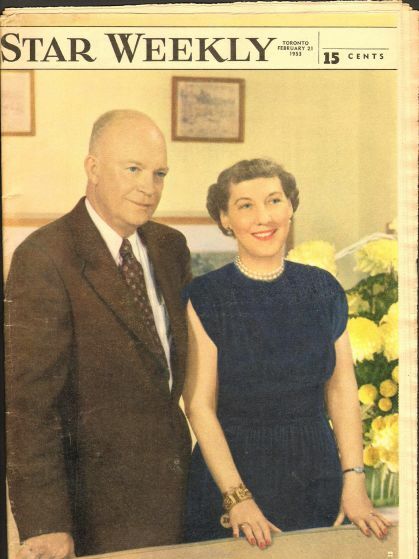 Here are President and Mrs. Dwight D. Eisenhower on the February 21, 1953 cover of the Star Weekly. 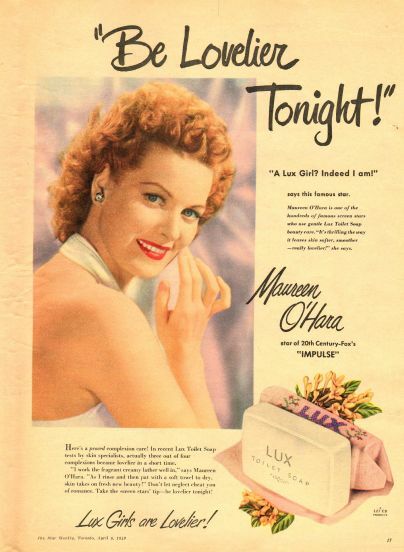 Lux ads that feature movie stars are popular with collectors. Here is Maureen O'Hara appearing in the film Impulse at that time.